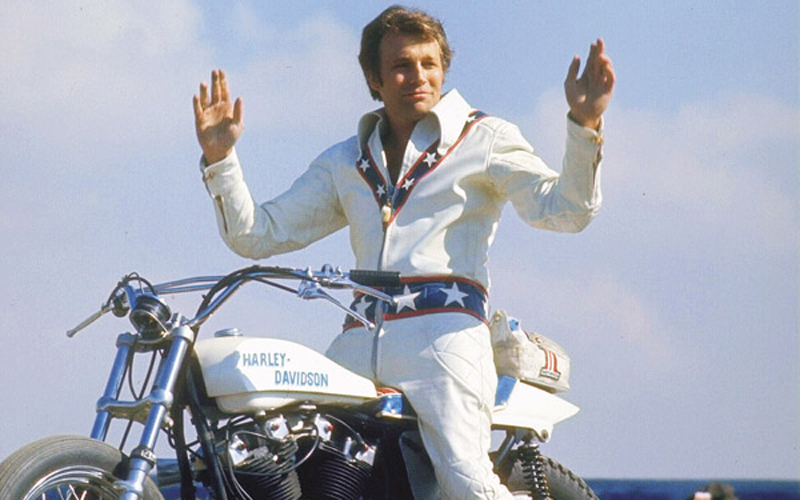 Of all Montana’s celebrities, perhaps no one is more famous than Evel Knievel. The Butte-born stuntman became world-renowned for his death-defying feats, popularized further by toys, merchandise, and a 1971 motion picture. Knievel (born Robert Craig Knievel Jr.) was just eight-years-old when he saw his first motorcycle stunt show. Years later, he dropped out of high school in favor of riding his motorbike and working in Butte’s copper mines. Ultimately, Knievel’s appetite for excitement cost him his job; the Anaconda Mining Company was unimpressed by his attempt to perform a wheelie in one of their earth movers . . . which he crashed into Butte’s main power line, leaving the city without electricity for hours. In 1956, Knievel led police on a high speed chase and was jailed for reckless driving. The cell adjacent to his was occupied by William Knofel, aka Awful Knofel. It wasn’t long before Knievel earned a nickname of his own, Evil Knievel, which he accepted but chose to misspell so as not to seem a bad man. Between the late ‘50s and early ‘60s, Evel Knievel’s exploits were numerous. He won a ski jumping championship, served in the U.S. Army, started a semi-pro hockey team, hitchhiked from Montana to Washington D.C., joined the motocross circuit, and opened a Honda motorcycle dealership in Washington. When Knievel’s dealership panned out as unsuccessfully as his previous jobs, he found work at a motorcycle shop and made side money putting on his own motorcycle stunt show. A small crowd paid to watch him jump a twenty-foot-long box with live rattlesnakes and mountain lions (which he barely cleared). In 1966, Knievel found a show sponsor in Bob Blair, owner of ZDS Motors, Inc. Together they started Evel Knievel and His Motorcycle Daredevils. Knievel was inducted into the Motorcycle Hall of Fame in 1999. Although he died in 2007, Butte still honors him each summer with Evel Knievel Days, a three-day celebration of their hometown icon and extreme sports stunts.